We have added a vintage inspired bath screen to our luxury Victoriana Collection. Our Victoriana Bath Screen incorporates a vintage style print on the glass, adding an on-trend design to over bath showering. This vintage design bath screen is in our luxury 8mm range and it is power shower approved and includes a unique seal system to avoid any leaking. 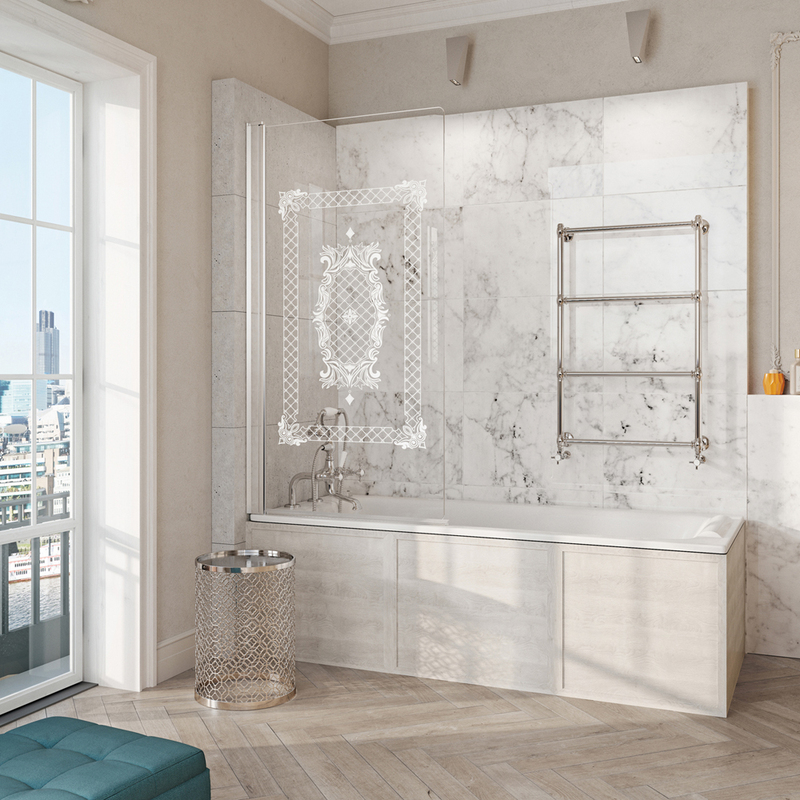 This power shower approved bath screen features chromed brass hinges, a bright silver frame and as with all Roman products the glass is pre-coated with Roman Ultra Care. This retro inspired bath screen will add a sophisticated finishing touch to any period bathroom design. We have added this Victoriana Range to our full collection as vintage styled bathrooms have strongly come back into fashion and this stylish period design will coordinate beautifully with the classic sanitary ware and tiles. The print is achieved with a white etch colour fired into the glass during the toughening process. Victoriana is a very British design that is not only well known and popular in the UK but also internationally and particularly in Western Europe. The Victoriana Range was originally one of our early glass designs when the company first began in 1985. It is now the right time for Roman to bring the product back after 30 years with an updated look. 2018 was the right time to bring the Victoriana Range back due to the desire for a more traditional and vintage style look in homes.